Examples include construction companies with tool rental divisions and commercial real estate companies that end up owning a hotel or a restaurant. You can’t run tool rentals or hotels with construction or real estate software. Those lines of businesses have very specific needs like front desk service kiosks. Most companies suffer it out doing consolidations in Excel as there is no way to easily write a financial statement or GL report that spans 2 different data dictionaries. This process is time consuming and stressful as errors are often caught after the Excel consolidation is started resulting in having to restart with fresh data. The process is also very expensive as it is usually senior staff doing the Excel consolidation as it is so complex. 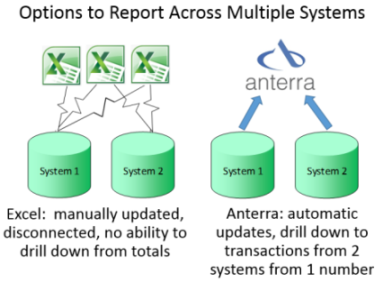 We solve this problem at Anterra by synchronizing both accounting systems into a single SQL database that we have designed. This enables drill through consolidated statement that span multiple systems. It doesn’t matter if the base accounts have a different number of digits or if the entities have different numbering formats – we map the raw GL information into one database and keep it synchronized automatically. We’ll be writing a Best Practice Guide on this process – feel free to contact us to discuss your consolidation needs.